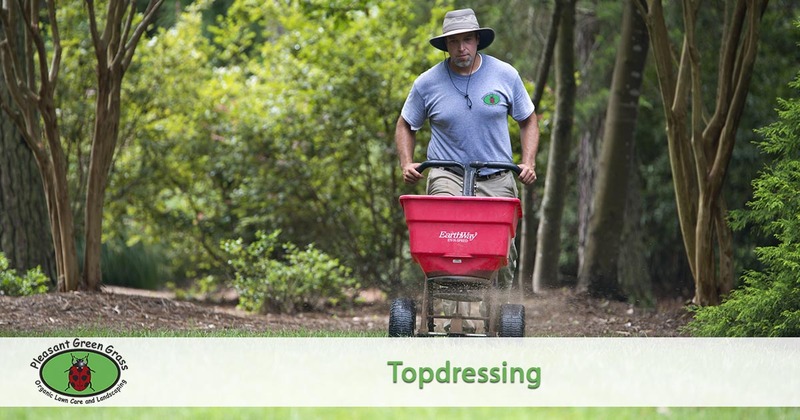 For lawn topdressing services in Apex, Cary, Carrboro, Chapel Hill, Durham, Hillsborough, Morrisville and the West Raleigh area homeowners turn to the professionals at Pleasant Green Grass. Soil health is as important as the health of the air we breathe and water we drink. Soil health is often overlooked and undervalued as an essential element in a balanced, sustainable environment. Healthy soil is critical for a healthy lawn and plants. In many areas of the triangle, the top layer of soil is thin. Construction and years of neglect have removed healthy soil and left the worst soil behind. In nature, organic materials decompose in order to feed soil and make it healthy. Typically, on our lawns, we remove the organic matter (leaves, grass clippings, old mulch) that creates healthy soil. We are removing the very elements that keep our soil in balance! In a nutshell, compost is decayed plant matter. Composting is a natural process of recycling and breaking down organic material such as leaves and vegetable scrap, plant residue, grass clippings and other yard waste over time. Those components form a rich soil amendment that gardeners fondly nickname, Black Gold. Compost energizes the soil food web, which is made up of microscopic bacteria and fungi, along with earthworms, crickets, and many other life forms. We source our compost top dressing locally. We typically core aerate before spreading compost so it gets deep into the soil. We only use about a ¼ inch thick application on established lawns so the grass won’t be smothered. Compost provides nitrogen, phosphorus, potassium, sulfur and micro-organisms that are essential for plant growth. It holds soil and water particles together to reduce erosion. It binds itself to polluting metals, pesticides and other contaminants to prevent them from washing into waterways or being absorbed by plants. The compost we use has been tested to make sure it has plenty of the proper bacteria, fungi, protozoa and nematodes that make things happen. We have done trials to see how well it germinates seed. This beneficial service adds certified organic matter and micro-organisms to the soil. Organic lawn treatments like this work towards improving soil structure and increasing soil life. This activity helps loosen the soil making it more permeable and fertile. Compost topdressing adds literally tons of much needed organic matter to the soil. It’s for customers who want to be more aggressive towards improving their lawn. The more life and organic matter you have in your soil the more microbial activity you have which is why compost is the best topdressing for the lawn. There is nothing that improves soil like compost. It is full of the life and organic matter that make for an active, healthy environment. Earthworms and microorganisms of the soil love it. Diseases and plant pathogens do not like compost. It has been carefully heated to kill opportunistic pests and weed seeds. There is too much competition in active, healthy compost for pathogens to thrive. We have seen a lot of lawns turn around after a compost application. Growing grass in a compacted, lifeless soil with little organic matter can be frustrating. Establishing deep roots and germinating seed in an active, healthy soil can be a gratifying experience. Once your grass is growing healthy and strong, you should follow up with organic fertilization & weed control, to keep it that way. Ready to schedule your topdressing service or just have questions? Give us a call at 919-357-8245 today! We will give you a free quote and make it easy to schedule your service.